The U.S. Federal Reserve announced a quarter point rate hike, on September 27, and raised the federal funds rate to 2%-2.25%. This marked the third-rate hike this year and the 8th since December 2015 when the Fed opened this round of rate hike cycle. After the meeting on interest rates, Federal Reserve Chairman Jay Powell held a press conference to explain Fed's views on the state of U.S. economy and the reasons behind the decision to increase interest rates. This article summarizes the main contents of Jay Powell’s meeting and analyses whether or not the central bank should follow the Fed's decision to raise interest rates. Finally, it elaborates on the possible impact of the Fed’s interest rate hike on domestic financial market. Judging from the contents of the meeting statement, the Fed is satisfied with the current economic situation. It believes that the current labor market and economic activities continue to prosper, consumer spending and commercial fixed asset investment have continued to maintain robust growth. From the perspective of inflation rate, both the overall inflation rate and the core inflation rate are very close to the target of 2%. It is worth noting that the Fed deleted the statement which said 'the monetary policy position is loose'. It was explained by Powell in the press conference after the meeting. Powell said the deletion will not be an indicator of any change in the future policy path, on the contrary, it is a sign that the current policy is in line with expectations. We still think federal fund rates will continue to rise in the future'. He also believes that current interest rates are low and overall financial conditions remain accommodative, and that a sustained return to normal rates through continued rate hikes would help support U.S. economic recovery. The is important thing to note in the meeting was the sudden increase in the actual economic growth rate forecasted for 2018. In previous meeting on interest rates, held in June, the Fed raised its real economic growth forecast to 2.8% from 2.7%, as earlier predicated in March. The interest rate in the meeting on September 25 significantly were raised from 2.8% to 3.1%. 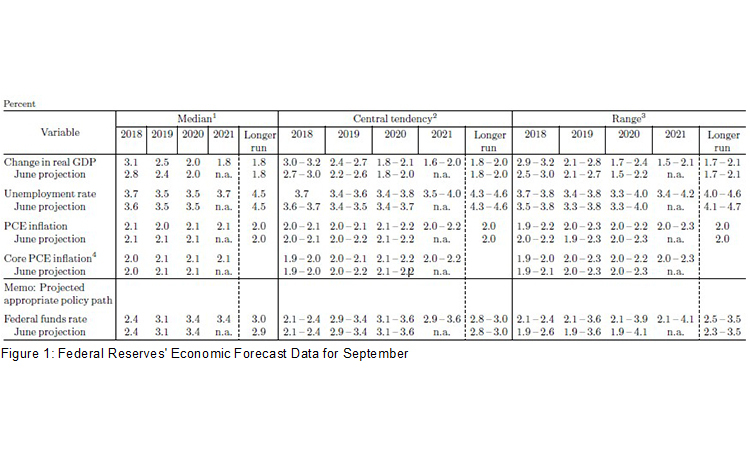 At the same time, the Fed also raised its forecast for economic growth in 2019 from 2.4% to 2.5%, indicating that the it is confident about the current economy (Figure 1). In addition, it's expectations on unemployment and inflation remained basically stable. The U.S. federal funds rate (FFR) target range is expected to rise to 2.25%-2.5% by the end of 2018, and 3%-3.25% to 3.5% by the end of 2019 and 2020 respectively. 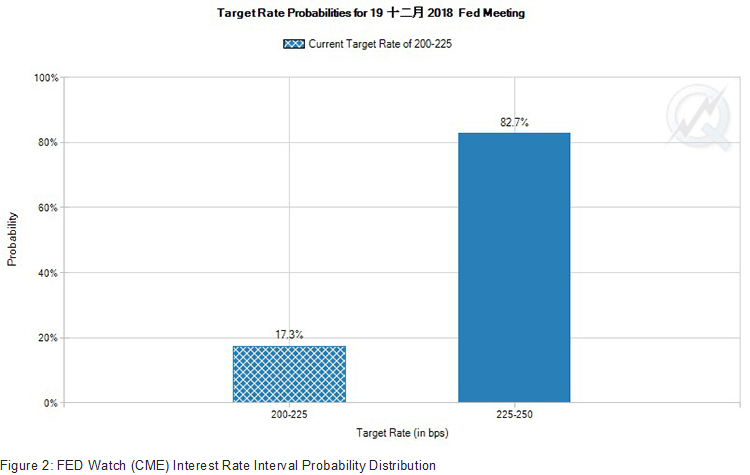 Judging from the dot plot released by the Fed, a total of 12 Fed officials submitted their forecasts, indicating that the Fed is likely to raise interest rates again at the end of the year. In terms of economic fundamentals, the U.S. economy has continued to recover gradually since the Fed raised interest rates for the first time at the end of 2015. Especially, since 2017, the job market has continued to pick up with increasing wages, consumer confidence has continued to grow (Figure 3), inflation has gradually returned to 2%, and manufacturing has experienced a robust recovery (Figure 4). At the same time, the implementation of large-scale tax cuts plan by the government has also spurred its economy to grow further in the short term. It can be said that the current U.S. economy presents the best economic state defined by macroeconomics, that is, the combination of 'high growth plus low inflation'. The recovery of the U.S. economy is the main reason why the Fed continues to gradually increase interest rates. III. Will the central bank follow Fed's decision to raise interest rates? Judging from the reaction of domestic official media and market institutions after the Fed's decision of interest rate hike, it seems that there exists certain disagreement on whether the central bank will adopt a follow-up strategy. 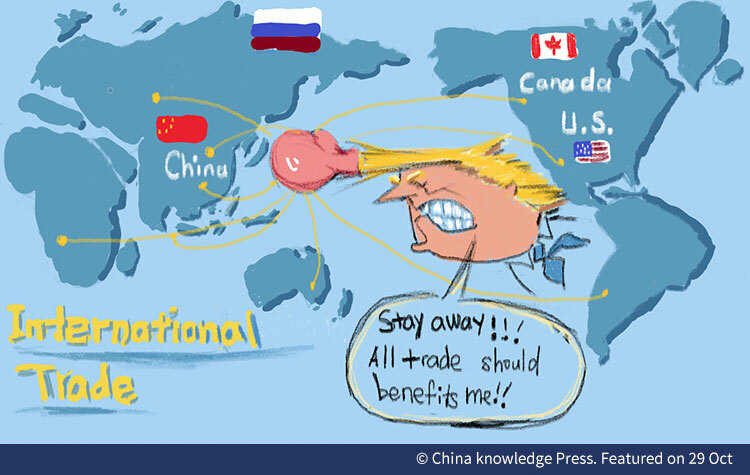 The front page of China Securities Journal stated that the current Sino-U.S. economy and policy cycle are not synchronized and the possibility of subsequent 'additional adjustment' is slim. Jiang Chao team from Haitong Securities Co., Ltd. believes that due to amounting downward pressure on the economy, following the interest rate hike is not very likely. In addition, the exchange rate of the U.S. dollar against RMB has been relatively stable, and the necessity to raise interest rates has decreased. Mingming research team with CITIC Securities Co., Ltd. believes that under the circumstance when the climax of U.S. interest rate hike has emerged and the future economic growth rate may decline, there is a small possibility that central bank will follow the Fed’s interest rate hike decision. Although it will help relieve the pressure of exchange rate depreciation. Since the end of 2017, the interests rate difference between China and the U.S. has narrowed. On the day before the Federal Reserve's interest rate meeting, the 10-year U.S. Treasury bond yield hit 3.113%, slightly lower than its 2018 high of 3.128% in May, this year. The yield on the 30-year U.S. Treasury bond hit 3.249%, its highest level since May 18. At present, the interest rate difference of the 10-year bond yields between China and the U.S. has narrowed to around 60bp, which has fallen to the lowest point since 2015, and has largely deviated from the '80-100bp' comfort zone, mentioned by PBoC Governor Yi Gang. The central bank has been afraid of raising interest rates due to restrictions on deposits and debt pressures. However, after the Fed’s rate hike, and the U.S. government’s rising deficit rate, the U.S. bond issuance will continue to increase. 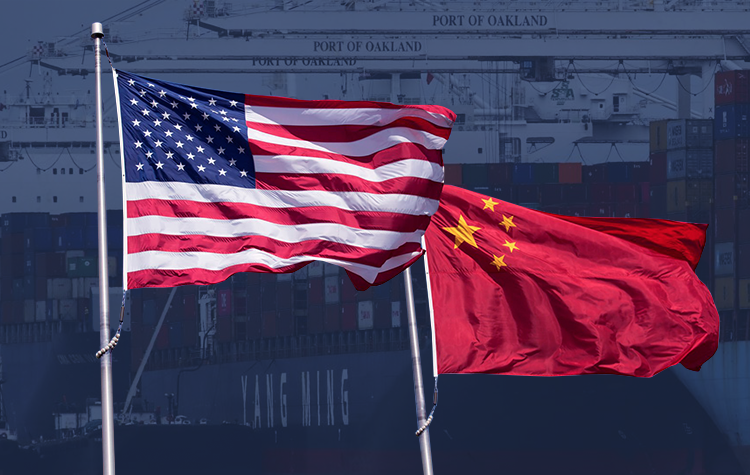 It is expected that the yield of the 10-year government bond will continue to rise, and the price difference between China and the U.S. further narrow down. 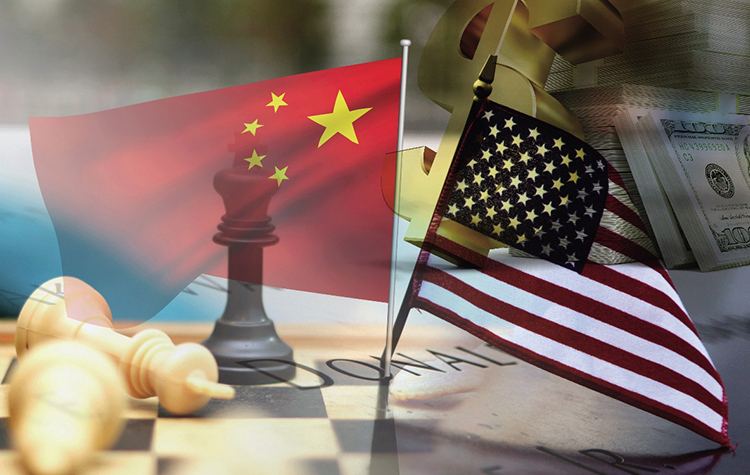 Under these circumstances, if there is no interest rate hike, it will lead to the narrowing of the 10-year bond price difference between China and U.S. The RMB exchange rate may be under pressure again, and the pressure of capital outflow may also tend to increase, which may lead to external financial risks. Based on the above judgments, it is expected that the central bank may raise interest rates slightly before the end of the year to avoid hang upside down between China and the U.S. and maintain the stability of the RMB exchange rate and capital flows. Given the increased expectations of the Fed's continued tightening, it is expected that capital outflows may increase and the base currency will continue to flow back to the central bank. Coupled with the possible increase in the issuance of local government bonds before the end of the year, to supplement the liquidity of the financial system, the central bank may continue to add liquidity to the market in the short term. However, given that the current MLF balance is already high, if the MLF is used to deliver liquidity, it will further aggravate the imbalance of internal fund allocation in the domestic financial market, and will also increase the operating pressure of small and medium banks. Therefore, the RRR cut is still necessary. In terms of domestic interest rates, the benchmark interest rate is not high, but the credit spread is relatively higher. To further reduce financing pressure of private enterprises, the central bank may cut the credit spreads in various ways, improve the financing environment and lower financing costs of private enterprises. At present, the U.S. economy continues its robust recovery and the Fed’s monetary policy is gradually tightening as planned. In addition to continuation of interest rate hikes as planned, the Fed will also intensify the shrinkage of the balance sheet before the end of the year. 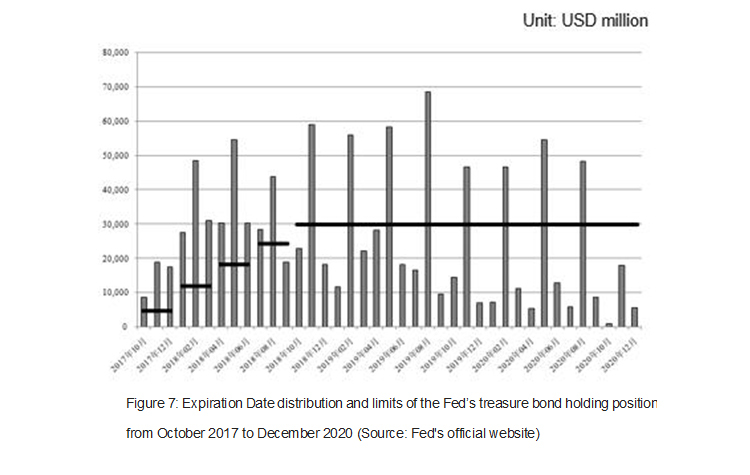 According to estimates by Zhang Qidi (2018), Fed's monthly shrinkage of the balance sheet in October and November is expected to scale USD 50 billion, significantly higher than the previous month (Figure 7). In addition to the U.S., the European Central Bank, the Bank of England and other advanced economies are also turning from the easing policy to monetary tightening. 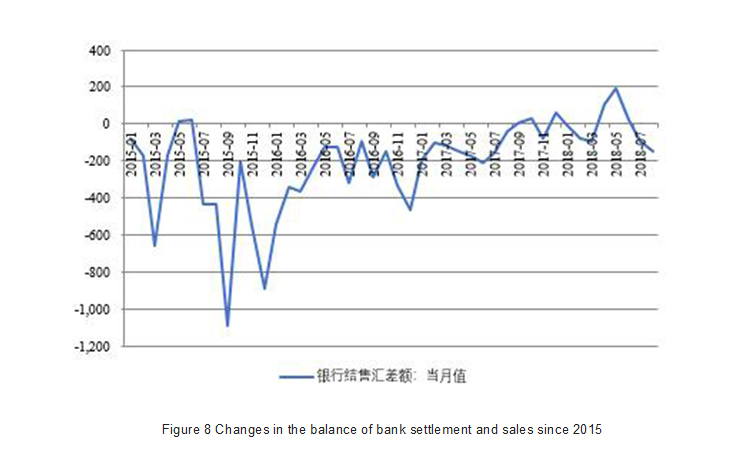 In addition, the latest bank settlement and sales data shows that in July and August 2018, the bank's settlement and sales balances reached USD -9.394 billion and USD -1.496 billion respectively, indicating that the current capital outflow pressure may have increased (Figure 8). 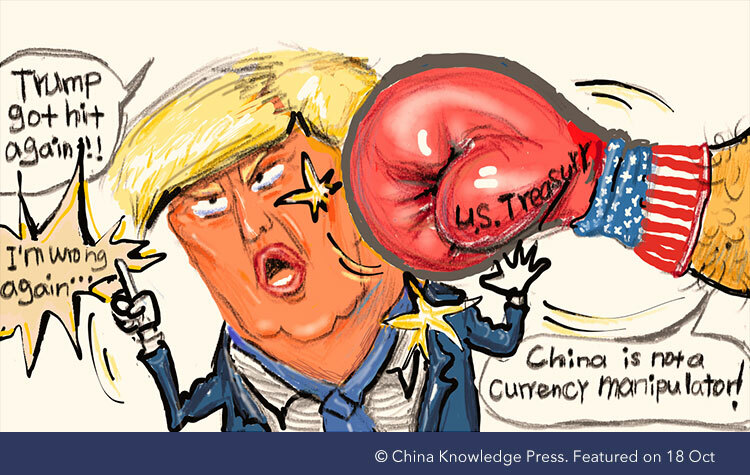 Therefore, in the context of rising global interest rates and the Fed’s continued interest rate hike, the RMB exchange rate will once again face greater adjustment pressure. Once the expectation of RMB devaluation is realized, both short-term capital as well as medium- and long-term capital may aggravate, and capital outflow pressure will also increase. According to Wind data, by the end of September 25, this year, there have been 74 defaulted bonds, with involvement of RMB 74.4 billion. 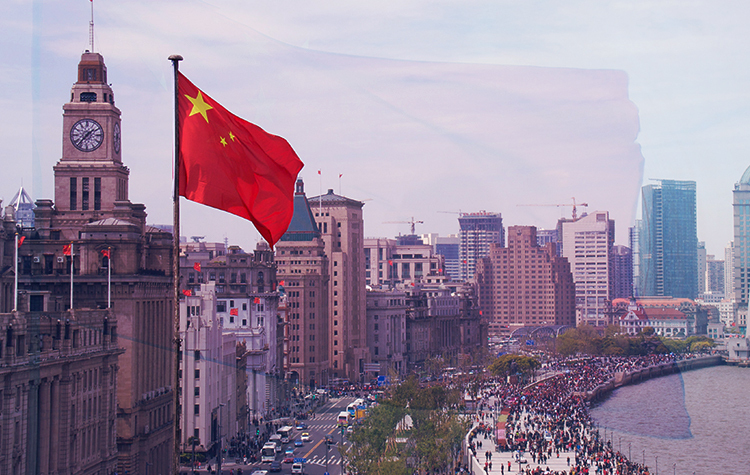 Last year, there were only 50 in total, which involved RMB 40.3 billion. It is foreseeable that as the Fed continues to tighten and is constrained by exchange rate conditions, it is expected that the domestic monetary environment will tighten again before the end of 2018. Interest rate levels will rise, and liquidity may be even tenser. 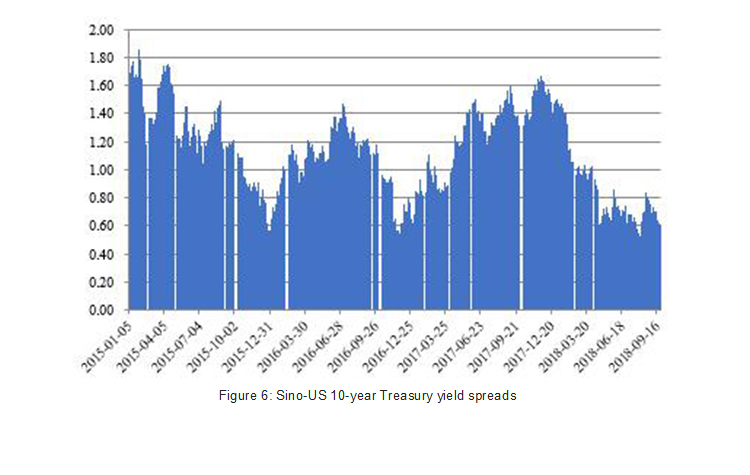 In the context of the current ineffective debt level, bond market defaults will continue to increase.